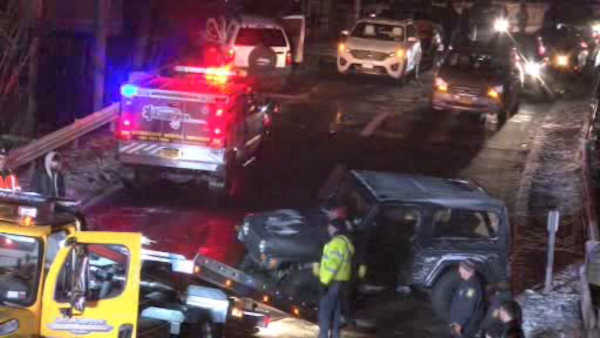 YONKERS -- The southbound Bronx River Parkway was closed for hours overnight between Scarsdale Road and Desmond Avenue following a multi-car chain reaction crash in Yonkers. Up to 14 vehicles collided in the southbound lanes, near the Palmer Road bridge Sunday evening. The cars were involved in four accidents that occurred between 9:45 p.m. to 10:15 p.m. and were blamed on slippery conditions. 10 people in the cars were treated for minor injuries. The Bronx River Parkway remained closed while workers evaluated the structural integrity of the Palmer Avenue overpass, which also remains closed. All but one lane was reopened by Monday afternoon. The right lane is open from Palmer Road to the Sprain Brook Parkway, while the left lane remains closed for ongoing guardrail repairs that are expected to be completed by the end of the day. The closures remained in effect late Monday night.